One of the biggest disagreements my husband and I have is over our finances. I’m a saver, he is not. It took several years before we were on the same page. We have learned how to set financial goals together. It’s wonderful to sit down and discuss how much money we have coming in, and to make a plan for the money we have going out. Doing this together also helps us live simply. At the beginning of every month we make time to have a budget meeting. We discuss the money we have coming in, and the bills that need to be paid during the month. Afterwards, we make a plan for money that is leftover. Is there something we need to purchase that we have put off? We try to add as much as we can to our general savings fund. Money in our general savings fund is currently used for emergencies and some of it is allocated for taxes, gifts, and other expenses that we know we will have during the year, but we do not have them monthly. My husband recently started a new career, so we had to sit down and discuss our insurance and retirement plans. All of the money we pay for our health/dental/vision and my husband’s retirement is taken out of his paycheck before we ever see it. Thankfully, we do not have a lot of consumer debt. The small amount we have we have made a plan of attack to pay off. I really like the method of the debt snowball from Dave Ramsey. You allocate a certain amount of extra money to put towards your monthly debt payments, usually starting with the debt that is the smallest. Once that debt is paid off, you roll the extra money + the minimum you were paying on that smaller debt toward the next debt. You continue doing this until all of your debts are paid off. These are the goals we agree upon together. We then make a plan for how we are going to achieve these goals. We share all of our accounts and we both know how much the other spends. Large purchases are not made without discussion. Communication is key. While I have taken a more backseat approach to managing our money because it causes me a lot of stress, I still know what is going on with everything. Budgets aren’t made to be broken. We work together to form a budget and we work together to hold each other accountable to that budget. Sometimes the reward may be the item you saved to purchase. If your goal was to add $1000 to your emergency fund, let yourselves have a little treat for accomplishing that goal. It could be as simple as a date out of the house that you’ve put off to achieve your goals. Maybe it’s just having coffee together at the local coffee shop. Don’t bust your budget, but if you don’t do anything while you’re working on your financial goals. you may get discouraged! We bank with USAA and I love using their app on my phone because I can easily track all of our spending. I am planning to put together a budget binder for 2015. It will make things easier to have a physical copy of all our income/expenses/debts/goals. I will use printables from The Uncluttered Lifestyle. I recommend Dave Ramsey for advice on becoming debt free and building wealth. 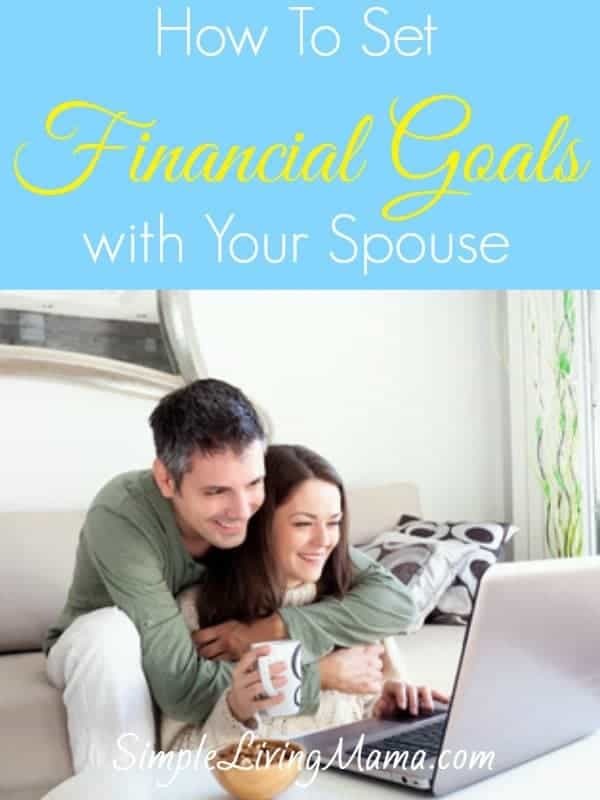 What are your best tips for setting financial goals with your spouse?